Any parent who has taken their child to a playground has witnessed kids behaving badly. Little ones still learning how to interact well with others and making mistakes is par for the course. Kids are not born inherently knowing how to share or about consequences and distinguishing right from wrong. That is why supervision, encouragement and discipline are so important to your child’s overall and social development. It is important to be engaged, involved and present. But does this philosophy apply to other people’s children? What if your child or someone else is in danger or being hurt and the adult in charge of the offending child doesn’t care or is not around? If you witness kids behaving in a mean, dangerous or disrespectful manner, should you interject even if the child is not yours? The simplest answer is, don’t discipline other people’s children. It is not your responsibility or your business. But if a child is in danger, or causing danger, it definitely is your responsibility to intervene or request the help of others. There are always going to be kids getting their feelings hurt or accidents resulting in a boo boo at the playground. These are normal interactions that assist in your child’s social development that probably do not require the five alarm bell. I am definitely not advocating for helicopter parent behavior – kids need to run around and be kids. 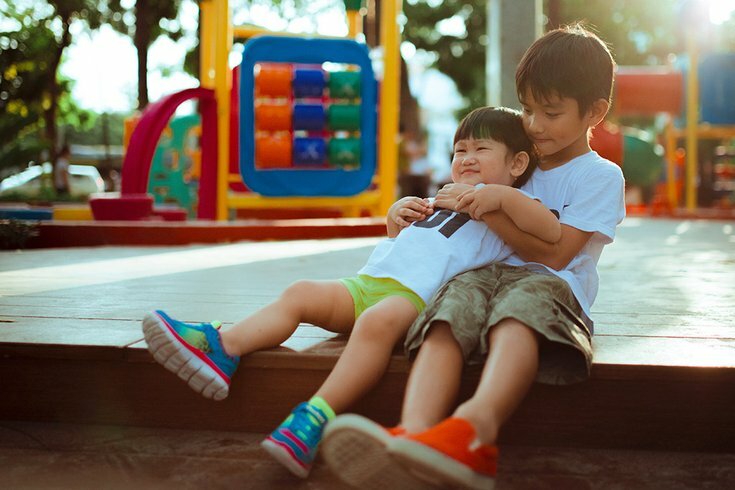 But I have heard numerous stories from friends whose children were the victims of bad behaviors – biting, hitting, kicking – most often occurring at the playground. Worst of all, accompanying adult was not around or did nothing about it. This can be a tough situation to navigate, which I did for the first time recently. My family was in Boston earlier this month and Killian had a blast playing in the Tadpole Playground at the Boston Common’s Frog Pond (which I highly recommend!). One area has four frog fountains that shoot water into the air for kids to run through. At 22 months old, I encourage Killian’s independence at the playground but also need to keep a close eye on him, so while he was playing in the water I sat nearby. There were some older kids, a group of boys around 10, who were also running around and having fun. At one point Killian looked closely into the face of one of the frogs, as if wondering where the water went. Before I could interject, one of the boys pushed the button to activate that fountain, which strongly sprayed water into Killian’s face. As my toddler sputtered, spitting out water and starting to cry, the boy laughed. He did it on purpose, was certainly old enough to know what he was doing was wrong and yet he enjoyed it. I did not even bother to look for his accompanying adult; my reaction was instant. I looked at him and said, “Do not do that again. He is little. You should know better.” I was glad the boy immediately apologized. After a towel-off, hug and a kiss, I encouraged Killian to keep playing in the fountains, which he happily did. Later, I spotted a woman I assumed to be the boy’s mother chatting with a friend. Her son is old enough to run around a playground mostly unsupervised and I did not think his behavior warranted speaking to her about what happened. I wondered what her reaction would have been if she saw me reprimand her son. I only know that if Killian behaves that way one day and I do not see it I would want another adult to correct him. After hearing stories from friends and having this recent experience, I did some research about what the experts recommend in these situations. • Do speak up. When you are the host, like having kids over to your house for a birthday party or a playdate, you are accountable for the safety of all the kids, so as difficult or uncomfortable as it may be, you will need to intervene if someone’s behavior is inappropriate, alarming, disturbing or dangerous. Even if you are at a public place, if you see something that warrants intervention, say something. Speaking with a parent or guardian about the behavior of their child can be really uncomfortable but sometimes it is necessary, especially if you reprimanded their child. • Don’t lose your temper. Yelling at your own kids is one (debatable) thing, but if you are reprimanding someone else’s do your best to keep your patience. Every family disciplines a little differently so tread lightly. Distracting, rather than punishing, is more effective when intervening with another person’s child. Try speaking to the whole group, if possible, rather than singling out one individual. • Do set expectations and ask for help. Caring for our own kids can be overwhelming at times. If you are having your children’s friends over, especially a large group, make it fun for all ages and ask the other parents to stay. Set ground rules and expectations so good behavior is encouraged in advance. These simple steps could help prevent issues from arising. • Don’t wait too long. Parents can spot the warning signs of trouble brewing or a meltdown on the horizon. When you see those signs, gently steer the activities in a way that could spare everyone from getting flustered or simply remove your child from the eye of the storm. • Do make your presence known. Sometimes the simple act of an adult being present, especially in a public setting like a playground, can curb bad behavior. Be around, be engaged and be present. • Do have the tough conversation. Speaking with a parent or guardian about the behavior of their child can be really uncomfortable but sometimes it is necessary, especially if you reprimanded their child. Whether for playdates, carpool or after-school activities, there are plenty of times when children are under the care of adults other than their parents. If you witness something that warrants a conversation, have it in a kind, respectful and non-judgmental manner. • Don’t forget to talk to your kids, too. Whether your child was hurt by or simply witnessed bad behavior, have a conversation with them after so they can share their feelings. Explain that your job as their parent is to help your child learn and grow and to also keep them safe. Talk to your children about appropriate behavior and why it is important to be kind to others. Explain your actions and reasoning if you had to reprimand another person’s child. Allow it to be a teaching moment. • Don’t forget that no child is perfect. This one threw a tantrum yesterday, that one will melt down tomorrow and the day after that it will probably be yours. Children are still learning and growing, so do not be too tough on them or on you. When you notice good behavior in your child, or another, go out of your way to applaud them.